Motto: You can probably just stop reading. This post is not for anyone. I wanted to write it, though. TL;DR - I read two books, one was good, one was not. Also - you should look to see if your local library has an app that you can get audiobooks from. Ours uses an app called Axis 360, and since I've discovered that my reading has skyrocketed. It's really really great. I recently read Broken Angels by Richard K. Morgan, the sequel to his first novel Altered Carbon. This Column is a review of that book... spoiler free-ish until the bold warning line. The Top 5 and quote are spoiler-free. I came to it by way of watching the Netflix series Altered Carbon. It opened my eyes to strong scifi, which I didn't know I liked. I've always been a fan of superhero stuff, which in a way is science fiction; but I've never been more than a casual fan of Star Wars, and I find Star Trek pretty unapproachable on the whole. There's a Google product you should know about; it's called Google Takeout. It is not a food service, so don't get excited. Don't make the same joke that literally 5 people I've told about this have made. Google Takeout is a service that allows you to take out your data from Google - in theory so that you could go to some other service and keep your data. In reality, it's probably best just for seeing an aggregate list of everything they have of yours and about you. I requested an archive of everything they had associated with my account, leaving out Google Drive (because I have 500GB+ in the cloud & don't need them to send me my own files back to me). Then I spent a week's worth of free time going through it all & taking 5 full pages of notes about what I found. This post is primarily the contents of those notes. Now, before we get into that. Remember how I said I want to write a book, and how I might dump stuff on here that's from the book? This is counting. I don't to write a book so that I can "I'm a guy who's written a book", but because I have something have I wanted to create since 2011, right before I graduated college. I've have vague and specific ideas about this thing I want to write. 8 years ago I started a Word doc to get some thoughts down. I've sat down many evenings since then and added to it. Right now it's a 57 pages... of mostly just outlines for content to come. The struggle I'm having is how to describe what I want the book to be. I want to write a study guide for every test I've ever taken. I want to make a reference book that also teaches fundamental concepts. I want to explain the concepts I learned in school how I wish they'd have been explained to me. I want to have something to give my son that teaches him what I've learned over the past 30 years. I have been thinking some about how stupid our conventions are for times and dates. I wonder if I could come up with something better. This Column is basically a thought experiment, as it progresses. The year is (roughly) 365 and 1/4 days long. We break that up into 52 weeks, each 7 days long. So inherently we've got a flaw there. The prime factorization of 365 is 73 x 5. So we COULD do 73 weeks, each 5 days long. Of course, then our structure for "weekday" and "weekend" would be all messed up. People would either have to work 4 days a week (8.6% more than a standard work week now) or 3 days a week (11.4% less). Also any sort of social structure that's set up to operate "every other day" would have a weird time dealing with weekends. BUT! A year isn't 5 x 73 days long, either. It's more like 5 x 73 + 0.2422 days long. 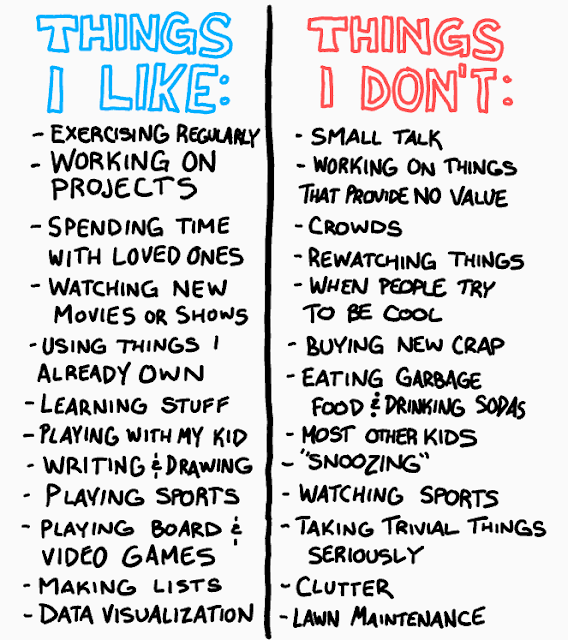 #362 - Things I like. Things I don't. Motto: Do You Have Any Apple Fritters? Then I realized the irony of the message, and pressed 'delete' instead of 'send'. I say it here because I thought it was funny. You ever make a table like this? If you haven't, maybe think about doing it. Or don't. I expected it to be more enlightening than it was. I have a Podcast. It's got a website in case you're not interested in Podcast apps... it's nothing fancy. Just a thing we do for fun.